It is 1761 off the coast of Italy, and 13-year-old Joseph Carlos and his cousin have just been kidnapped by the British Navy and impressed into service on the Deptford, a British man-of-war. Just the day before the two boys were happily sailing with their uncle on a routine merchant passage, dreaming of owning their own ship one day and returning home to the warmth and safety of their family. What was supposed to be a “punishment” for a childish misadventure turns into a fight for survival on foreign seas. The boys have to rely on each other as they struggle with a new world of unfathomable rules and codes, near-death floggings, lethal storms, and intrigue. Their endurance depends not only on their own bravery and stamina but on how fast they can learn English. For the next two years the ship becomes their prison, their classroom, and their home. Eventually, Joseph Carlos has to make a choice that shapes what kind of person he becomes. 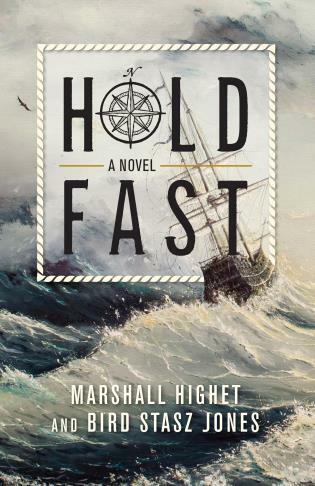 Hold Fast is a young adult, historical novel in the vein of Kidnapped. Based on a true story, it combines brutal storytelling and a poignant sense of humor while tracing the route of the Deptford across the Atlantic Ocean. This book follows the lives of two Italian boys, but it also tells the story of Harrison, the Sea Watch, and the discovery of longitude. Marshall Highet is a professor and writer. Her YA sci-fi novel Spare Parts was published in 2014. Spare Parts also has an educational bent and Marshall has worked in tandem with middle school, high school, and college educators to create a syllabus that pairs with the book. She also maintains a social media presence to keep up with her readers. She lives in Pittsburgh with her family and two neurotic rescue dogs. Bird Stasz Jones is Professor Emerita at Elon University with over 30 years working with teachers and young people in the United States and abroad. This is her family story and is based in historical fact (with fiction filling in the gaps). She lives in Vermont and Rhode Island.